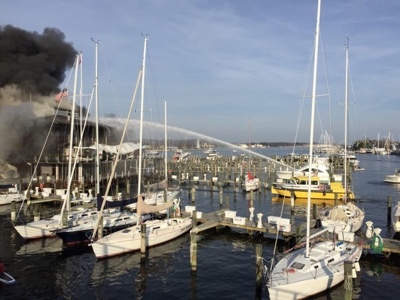 A 3-Alarm fire is currently ravaging the Annapolis Yacht Club located at 2 Compromise Street. Most downtown streets are closed and the fire is being attacked from the land as well as the water. Images via readers via Text and Twitter. There has been one firefighter transported from the scene with injuries. Unconfirmed reports from employees of the club indicate that a Christmas tree may have caught fire. This has yet to be confirmed by fire officials. On December 12, 2015 at 2:16 PM the Annapolis Fire Department was dispatched to a fire at 2 Compromise Street. The Annapolis Fire Department is currently on scene with a 3 alarm fire. The fire was called in by the fire alarm company, then 911 dispatch was quickly flooded with calls reporting smoke from the building. There are currently approximately 34 pieces of fire equipment on location, with approximately 90 firefighters on scene. One firefighter has had a minor injury and was transported to the hospital. There are no reports of any civilian injuries at this time. At this time, the fire has not been placed under control, and it is too early to determine a cause or estimate of damage. The picture above shows Annapolis' FireStorn 36 responding to the blaze. From ABC Eyewitness News in New York City. The William M. Feehan is a 66-foot long, 90,000 pound, jet-propelled fireboat with the ability to pump more than 8,000 gallons of water per minute. The $4.7 million vessel was built in Canada by Metalcraft Marine and was largely funded through FEMA's Port Security Grant Program. MarineLink.com: FDNY Honors 9/11 Hero Feehan at Boat Christening. Quite a scene at a Lake Union Marina recently. SEATTLE -- Ten boats were damaged in a massive marina fire early Monday on Seattle's Lake Union. Flames and smoke were seen shooting into the air from the Western Yacht Sales building around 1 a.m. Firefighters contained the fire to one building and knocked it down in about 40 minutes. Seattle Fire Lt. Sue Stangl says five people who lived on the boats were evacuated as the fire overtook the building. According to the Seattle Fire Department, eleven boats were damaged including four that sunk. Crews remained on scene for hours mopping up hot spots. The Coast Guard and state ecology officials went to the Boat World Marina to check on any pollution caused by the fire. They called in the National Response Corporation, which set up a containment boom to clean up spilled fuels. About 70 firefighters responded to the fire. They doused it with foam to prevent leaking fuel from spreading the fire to other boats. Stangl says some boats that were on fire floated away. That can be tricky because they can float to other piers and docks. Westlake Avenue N. was closed overnight, but reopened in time for the morning commute. Investigators say an unattended candle caused the fire. Here are interesting on-site reports from King 5 News and Q-13 Fox. Seattle has two MetalCraft Marine FireStorm 50's in service, one of which is 10-years old. (October 12, 2015) MetalCraft Marine Incorporated would like to congratulate FDNY on the completion of their new . The newest member of New York’s Bravest will be christened William M. Feehan. FDNY has had a long history of serving the needs of their community dating back to 1648. It wasn't until 1865 that the modern-day Fire Department was first established. The professional force was needed to better provide protection to the fast-growing and increasingly complex metropolis. The first reference to the nomenclature F-D-N-Y was made in 1870. This particular version of MCM’s 70 footer is scaled down slightly to fit the FDNY’s needs. Our traditional FireStorm 70 is four feet wider, slightly longer and has a much larger cabin/tool room. MetalCraft Marine Incorporated is a fully integrated designer and manufacturer of custom high performance fire, rescue, patrol, research and other specialized work boats. MCM was established in 1987 and is a World leader in the design and manufacturing of aluminum high speed, high pumping craft. With over 630 hulls built to date, in service vessels include Boston, Port of Houston, Washington DC and Miami Fire Departments along with US Coast Guard, US Navy, Panama Canal Authority and many other Ports around the Globe. "The name of the new boat "William M. Feehan" holds special meaning to FDNY. First Deputy Commissioner Feehan was killed on that fateful morning terrorists flew hijacked jetliners into the twin towers on Sept. 11, 2001. At 71, he was the oldest of the 343 FDNY members who perished. Feehan was a blaze-battling legend in his own time, heralded for his intuitive knowledge and cunning in fighting fires. He was thought to have known the location of every fire hydrant in the Big Apple and remains the only FDNY member to have held every rank in the department, from probationary firefighter on up to fire commissioner. The name plate held high on along-side the cabin of their new fireboat is milled from an I-beam lifted from the rubble and ruin of the World Trade Center 14 years ago. "He was a fireman's fireman," Salvatore Pastore said over the phone from Brooklyn. Pastore is a lieutenant with Marine Company 6 as well as FDNY liaison with MCM for the new boat. "We'll never forget any of the firefighters we lost that day," noted 28-year veteran Pastore. "But this lets 'Chief' Feehan's family know that we're remembering him in a special way." “It has been a great pleasure working with the FDNY organization, their knowledge of both the Marine & Firefighting aspects combined, has made this vessel a one-of-a-kind machine. I have thoroughly enjoyed every step of the process and have learned from them during the course of the build. Wishing them All the Best and Stay safe.” Jay Milner – MetalCraft’s Project Manager. The William M. Feehan sailed from MCM via Lake Ontario to the Erie barge Canal, down the Hudson and out at NYC. The journey took 4 days and had a huge welcome upon entering the NY harbor on October 12, 2015. FDNY Marine Companies are the New York Fire Department's fireboats and are tasked with SCUBA/Dive Rescue and off-land firefighting in New York's rivers and harbors. The FDNY's three Marine Companies operate large fireboats and smaller, secondary rescue boats to respond to various marine-related emergencies. Mission: emergency response, patrol, mobile command center, firefighting, CBRN capable. Here's a story from the New Haven Register. GUILFORD >> The Guilford Fire Department has come a long way since the 1976 Faulkner’s Island fire that destroyed the light keeper’s house and scorched the tower. “By the time we got there the island was an inferno,” said one firefighter. “We didn’t stand a chance, but we did what we could,” according to faulknerslight.org. 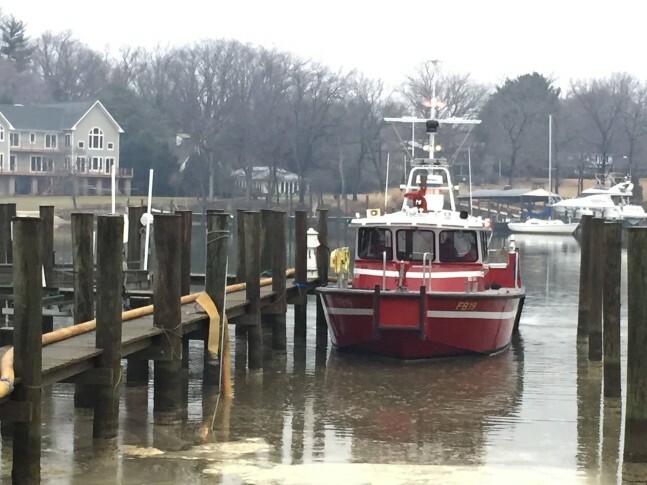 Now, permanently docked at the Guilford Town Marina is a $457,000 aluminum fireboat ready and available for any emergency that occurs on Long Island Sound and beyond. A federal grant covered 75 percent of the cost, while donations from the Harbor Management Commission, Marina Commission, Shellfish Commission and Sachem’s Head Yacht Club offset the 25 percent of the town’s burden of the cost. “It’s an excellent piece of apparatus that now is a part of our fire fighting/life saving equipment in the Guilford Fire Department,” said First Selectman Joseph Mazza. A committee worked closely with MetalCraft Marine in Kingston, Ontario to design the new boat. It replaces the previous fireboat, in service since 1988, which was basically designed for sport fishing. “It was actually a four-agency response,” he said. “We had 12-foot waves and 70-mile-an-hour winds. Whether it is a boater’s distress call, a swimmer in danger, or a fire at a dwelling close to the shore, the boat is equipped to answer the call. “This is going to increase our capabilities as far as fire fighting at sea, also with rescue, any HazMat issues we’re going to have and we certainly have dive capabilities, which we didn’t have before,” said Beauvais. Talking to Beauvais, along with Assistant Fire Chief Wayne Vetre and Firefighter/EMT Mike Perez aboard the fireboat, it is clear that whether there is another emergency three miles out on Faulkner’s Island or anywhere along the area coastline, the Guilford Fire Department is prepared to take on the task. For firefighting from Long Island Sound, the boat is equipped with multiple water sources — the water cannon/water monitor in the front center of the boat, a pump on the side and the capability to attach hand lines/canvas hoses to the back of the boat to simulate a fire hydrant. The vessel provides “another level of protection to the homes on the shoreline, so we can fight a fire not only from the land, but also from the water, itself.” Mazza said. The boat is also equipped with a siren, PA system, generator, two chart-plotting systems, high definition radar, sonar, a dive platform and a Forward Looking Infrared (FLIR) system “to navigate in absolute darkness,” explained Beauvais. In the first two weeks of operation the boat was dispatched four times, including aiding a sailboat that ran onto Goose Rocks, a small child on a sailboat that went into the rocks, a lost mast out by Kimberley Reef and a search for kayakers, out longer than expected. Of the 36 career fire department employees, every single one of them will be certified crewmembers. In addition, some will receive their captain’s license, which requires additional training. “They have to be aware of all the navigation rules and laws and be very intimate with the boat and all its systems so they can troubleshoot anything that might happen with our own boat to be able to respond to something,” explained Beauvais. The 14,000-pound, 30-foot-long boat, with twin 300 hp outboard motors, will be in the water all year round, which was not possible with the former watercraft. Equipped with some ice breaking capabilities it will be ready and available for any emergencies that occur even in the dead of winter. There are also the duck hunters out on the water until the end of January and the year round studies being done on Faulkner’s Island that could possibly necessitate assistance. This newest addition to the fire department makes Guilford residents, in addition to all those up and down the Shoreline, much safer while on the water. “Firefighters are safer, the people that we’re looking for are in a better way because we’re safer,” said Vetre. The firemen view their job on the water no differently than that on land. “When you have a fire you expect the fire truck to show up,” said Vetre. “You don’t expect a van with some things in the back that they might be able to fight the fire with. (September 14, 2015) MetalCraft Marine Incorporated would like to congratulate Savannah Fire & Emergency Services on the receipt of their new Firestorm 50. The newest member of Savannah’s marine fleet is to be christened September 15, 2015. Savannah Fire & Emergency Services (SFES) is steeped in history that dates back to 1759, this was the date of the city's first organized fire company. Today Savannah Fire is a progressive, future-focused organization comprised of more than 300 professional, fully-trained, career firefighters. Designed and built by MetalCraft Marine, this custom aluminum fire/rescue vessel measures 50 feet 5 inches long and has a Beam of 16ft. It is a diesel-water-jet propelled boat with Twin Cummins QSM 11 engines producing 705hp each, along with, twin 364 jets from Hamilton Jet. Combined with MetalCraft’s unique hull form, this gives the vessel a top speed of 37 knots and a comfortable cruising speed of 31 knots. The vessel was designed with considerable input from SFES’s expert fire-fighting personnel. This FS50 can produce 7300 gallons per minute at 150psi pumping pressure, from twin Hale pumps. The vessel is well equipped to fight both ship-board and on-shore fires, conduct search and rescue missions, supply large amounts of water to shore based assets, and operate as a mobile command center. The speed, combined with its full size patient birth area and water level recovery deck, make the Firestorm 50 ideal for EMS response and dive operations in addition to fire-fighting. Should that name be William M. Feehan and it graces a state-of-the-art fireboat, and should those 14 letters, which when tied together commemorate a hero, are milled from an I-beam lifted from the rubble and ruin of the World Trade Centre 14 years ago, well, then the answer is: Plenty. That name needs no introduction to the 10,000-plus members of the New York City Fire Department. Feehan was a blaze-battling legend in his own time, heralded for his intuitive knowledge and cunning in fighting fires. He was thought to have known the location of every fire hydrant in the Big Apple and remains the only FDNY member to have held every rank in the department, from probationary firefighter on up to fire commissioner. Feehan died on the job the morning terrorists flew hijacked jetliners into the twin towers on Sept. 11, 2001. At 71, he was the oldest of the 343 firefighters who perished. "He was a fireman's fireman," Salvatore Pastore said over the phone from Brooklyn. Pastore is a lieutenant with Marine Company 6 as well as FDNY liaison with MetalCraft Marine, the Kingston company that built the boat. "This" refers to the aluminum-hulled fireboat, an 18-month undertaking and No. 600 overall in the MetalCraft books, all constructed at Anglin Bay, a tucked-in spot where they've been building watercraft since the 1700s. The "fast response" boat is equipped with five stainless steel water cannon capable of dispensing some 8,000 gallons per minute, including a single remote-controlled cannon on the cabin top that shoots out approximately 25,000 litres every 60 seconds. The reach is just over 120 metres, better than the length of a Canadian gridiron. There are also three large-diameter hose connections, essential elements in supplying water to crews fighting fires in the aftermath of the 9-11 attacks. Just shy of 21 metres in length, the William M. Feehan is powered by a trio of Caterpillar C-18 engines, each capable of pushing out 1,150 horsepower, with twin fuel tanks splitting 4,500 litres. Running at a top speed of 40 knots (about 75 km/h), it can stop in two boat lengths. Parking in tight quarters is a manoeuvre straight out of The Jetsons. "We had it down to Treasure Island Marina last week," said MetalCraft contracts manager Bob Clark. "The guy from New York squeezed it between two other boats at the gas dock with maybe two feet to spare on either side. It was amazing. With those water jets, you can pretty much go in sideways." Now for the historical feature: Letters comprising a three-and-a-half-metre-long name fashioned from steel salvaged from Ground Zero. When the four rectangular slabs arrived in Kingston via truck, it took five men to lift and place each one on a skid. MetalCraft project manager Jay Milner was at first taken aback, not by the staggering weight but rather the symbolic aspect. "I took two steps back in awe," Milner said. "I mean this was/is an important piece of history, the significance. "We were honoured to have played a part in this tribute." The steel was first sent to Trenton to be milled, then machined down into individual letters at Woodman's Machine Shop in Kingston. "It was pretty neat opportunity for us, quite moving actually," Woodman's supervisor Dwayne Woodman said of the two-week job. "All the guys were eager to work on it; some even offered to put in their own time." The capital letters, 28 in total, each three-quarters of an inch thick, were painted -- what else -- fireboat red and mounted on aluminum plates. The name runs along both sides of the boat. Later this month, the William M. Feehan embarks on a five-day journey ending in the waterways of Gotham. This time next month, the $4.7 million craft will be in service, plying the Hudson and East rivers. The boat's christening takes place on the Hudson River in the first week of September, in the same North Cove Marina where fireboats were moored on 9-11, Pastore said. Feehan, the son of a fireman and a decorated Korean War veteran, joined the department as a "probie" in 1959. He was one month from celebrating his 42nd year of active service when the north tower collapsed on his command station. "Retirement," his son John, a third-generation firefighter, was quoted in a New York Times obituary a few days later, "never entered his mind." All three MetalCraft Marine FireStorm 70 Fireboats near Houston attended a huge fire following a barge collision near Galveston, Texas yesterday. Update: Here's a good video from Yahoo Australia News. Melbourne Fire Brigade has today unveiled the newest member of its marine fleet – Fireboat 2 – a world-class, firefighting vessel that will protect Melbourne’s waterways and marinas. Measuring 12 metres long, the water-jet powered craft, christened Prometheus, was purpose-built in Canada and can travel at speeds in excess of 32 knots. At a cost of $1.4 million, CEO Jim Higgins said the investment is an example of the increasingly diverse skills needed by the modern fire brigade and recognises the growing importance of marine infrastructure in the development of Melbourne. “The increase in boating activity, rise in waterside living and recreational activities and escalation in port traffic and cargo coupled with the nature of hazardous goods carried are all factors contributing to the likelihood of fire or emergency incidents in the bay,” he said. MFB’s increasingly diverse capabilities in the complex urban environment of Melbourne include emergency medical response, high angle rescue, urban search and rescue, hazardous materials and scientific officers and fire investigation. MFB has trained more than 100 firefighters in shipboard fire fighting, and currently has 40 firefighters trained as coxswains. A full suite of radios to enable communications with marine vessels, MFB/CFA appliances, other Emergency Response Organisations, such as Victoria Police and the Regional Control Centre. Capable of providing medical care and in an emergency tow a distressed vessel to a point of safety. Read more: Fireboat 2 Technical Specifications. Built to Lloyds Registry Standard, the vessel is fully compliant with Australian Standards and has been certified by Transport Safety Victoria as a Class 2C vessel under the National Standards for Commercial Vessels (NSCV). The vessel is capable of carrying a fire-fighting team of eight, at up to 33Kts. Fitted with four monitors and a foam generating system, the vessel can deliver approximately 16,000 Litres of water per minute. The vessel is designed to respond to incidents in the Docklands precinct and throughout Port Philip Bay, by day/night in up to sea state five/force seven winds. The Anne Arundel County FD Fireboat is a Firestorm 40 we designed and built in 2002. 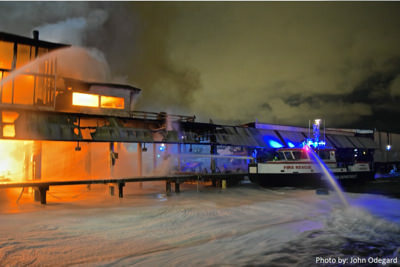 Here's a recent news story from WTOP Washington DC News about a multimillion-dollar waterfront mansion fire where the vessel assisted. Monterey Fireboat 'The Pearl' still going strong"
Here is a very cool video courtesy of the City of Monterey.